Aug 30, 2013 by Daniel H.
There are basically two types of public restrooms: those we use with a bit of caution and those we would not enter without full hazmat gear. Contrary to popular belief, you will not always find the cleanest bathrooms where you would expect. Likewise, you are likely to find dirty bathrooms in some of the places you where you would expect five star cleaning ratings. Brace yourself, what you are about to read may be somewhat disturbing. So, grab some hand sanitizer and prepare to be educated about the good, the bad and the ugly. Actually, public restrooms are probably not as hideous and germ-ridden as your mother warned you. While these probably won’t make it on Luxury Restroom Rentals’ top 10 list, you will not likely get flesh eating disease from a public restroom. The most common germs found in public restrooms are on the door handles, the interior stall latches, toilet paper roll and the sink fixtures. Whenever possible, avoid touching these items during future visits. Use a paper towel or your sleeve to open exterior doors and avoid coming in contact with these dirty places. Most companies and designers have embraced the touch-free sinks and hand dryers, and have also opted for the open entrances rather than having a handle to pull open. There used to be a school of thought that subscribed to the belief that the handicapped stalls, or whichever were at the far end of the restroom were the cleanest. This probably came from the idea that they were used least often, and it is just poor manners for just anyone to use the reserved stalls. 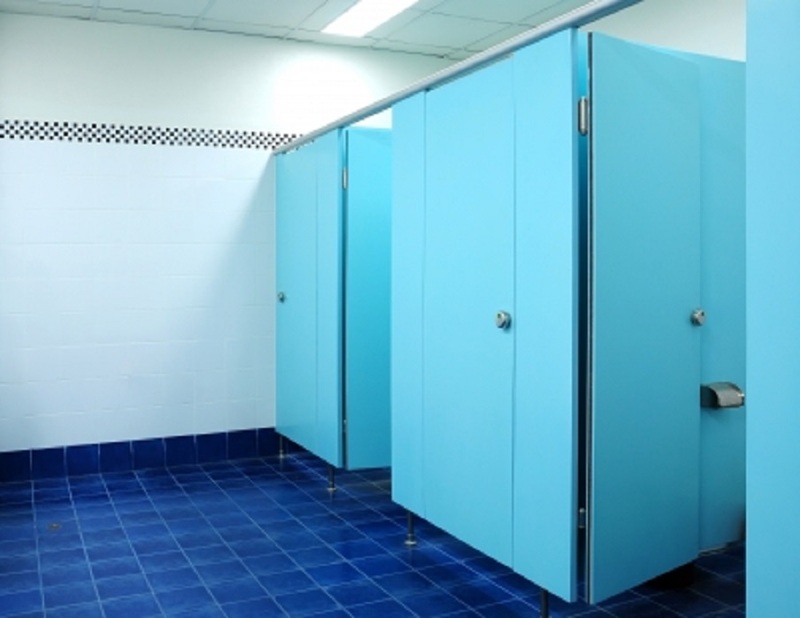 However, research suggests that there is really no noticeable difference in cleanliness between stalls. Each individual stall is just as clean, or dirty, as the next. This is actually a common sense explanation. Cross contamination occurs when the same washcloth or sponge is used in each stall. Hopefully, these are not the same cleaning tools that are also used in the sink basins. One of the biggest critiques of those in the sanitation business is the “dirty mop syndrome.” Using clean mops with dirty water, or vice-versa basically undermines any real attempt at cleaning a bathroom. As a society, we probably have low expectations for gas station, airport and movie theater bathrooms. It would not be surprising to find things out of order in these locations – trash on the floor; items in disrepair and general uncleanliness are to be expected. But our favorite restaurants, hotels and resorts are not above reproach, and are often no candidates for the luxury bathroom of the year award. Studies show that most of these locations have a superficial appearance of cleanliness, but hide secrets of filth and poor sanitation. The laminated check-in lists taped to the back of the door indicate that the restroom is given an hourly inspection, which makes customers feel secure that they are in squeaky clean facilities. However, the hourly tokens are largely just picking up trash and quickly wiping down of sinks and possibly toilet seats with plain water.